We organised a successful celebration event in partnership with the Disability Focus Group with help and support from SALIX Homes, the Salford Health Improvement Team and SALT. The event took place at the Pendleton Gateway Centre on 24th June 2011 and attracted a lot of interest across the area including residents living in high rise blocks and the communities of Seedley and Langworthy, Ordsall and other areas of Salford. The event was funded by SALIX Homes, the Salford Health Improvement Team and SALT. Members of the Salford Forum for Refugees and People Seeking Asylum along with the Disability Focus group, showcased their traditional meals whilst providing information about their countries and talking to local people about their culture and traditions. 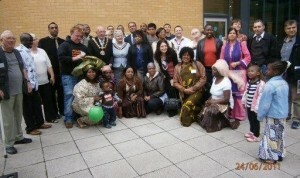 The event provided a great opportunity for local people to meet and get to know their neighbours, who are from different cultures and backgrounds as well as bringing them together in a fun environment and contributed greatly to community cohesion in the area. The Mayor of Salford, Councillor Eric Burgoyne and the Mayoress also attended the event and enjoyed a fashion show presentation themed around cultural clothes from different countries and traditions. A short drama was also played by the group members about a young asylum seeker’s experiences of applying for asylum in the UK and local people’s perception of asylum seekers and all the related issues. As part of ‘Refugee Week’, we worked together with SALIX Homes, SALT and the Salford Health Improvement Team and made a DVD on diversity and disability. The people who took part in the making of the DVD talked about their perceptions of diversity and disability and their own experiences. The DVD was shown at the event for the first time and the plans are in place to use the DVD as an educational tool in schools in the Salford area. This was funded by SALIX Homes and managed by their Customer Involvement Officer, Debbie Broadhurst. The celebration event was a huge success and more than 200 people across Salford attended the event and celebrated Refugee Week while enjoying the free activities organised by our group and the Disability Focus group.